Below you will find a general list of what we have on hand most of the time. 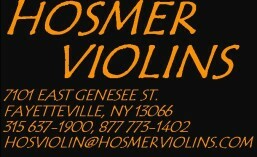 Please call with your needs—anything that is available in the violin world is only a phone call or a mouse click away. Any text in yellow is a link to the manufacturer’s website.New Instruments: Heinrich Gill, Clement & Weise, Cracovia Workshop, Guanzhou Cremona, HYV, Gliga, Calin Wultur, Rudoulf Deutsch, Mingzhaing Zhu, Yuan Ji, Deng Yan Shan, Zhou Zhang, Xueping Hu, Xuechang Sun, Scott Cao, Samuel Shen, and many others. Over 100 instruments on hand at all times. Accessories: Rosin, Mutes, Wolf Eliminators, Humidifiers, Metronomes, Tuners, Chinrests, Tailpieces, Shoulder Rests, New Harmony Cello Endpins, Cello Endpin Rests, Music Stands, etc.